Spencer Suderman is not only one of the most exciting air show performers on the planet, he is also a Guinness World Record holder! 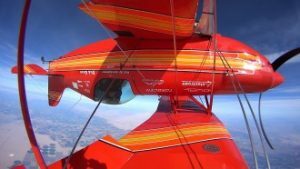 On March 20, 2016, Spencer flew the Sunbird S-1x, an experimental variant of the Pitts S-1 biplane to an altitude of 24,500′ in the restricted airspace over the Barry M. Goldwater Range in Yuma, Arizona then entered an inverted flat spin. At an altitude of 2,000′ the recovery was initiated and the Sunbird smoothly returned to level flight at 1,200′. A new world record of 98 inverted flat spins crushed the previous Guinness World Record of 81 that Spencer set in 2014. Spencer began flying while in college in the late 1980’s and quickly advanced from private pilot to commercial pilot with an instrument rating. 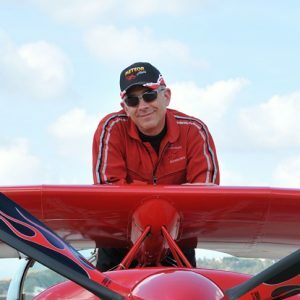 In 2002 he became a Certified Flight Instructor (CFI) and now holds an FAA unrestricted Statement of Aerobatic Competency (SAC) card allowing him to perform solo and formation aerobatics down to surface level. While working on his instrument rating, Spencer discovered that aerobatics are amazingly fun and quickly lost interest in merely flying straight and level. After attending numerous aerobatic contests in the Super Decathlon aerobatic trainer rented from a local flight school he moved up to the high performance Pitts S-2B. He’s been performing in air shows since 2006 and the plane was dubbed the “Meteor Pitts” because it shoots across the sky with its unique hot rod style flame paint scheme. Spencer’s air show performance uniquely showcases the capabilities of the Meteor Pitts Biplane with Intense gyroscopic maneuvers like the Double Hammerhead and the Inverted Flat Spin with its signature corkscrew smoke trail as the plane drops towards the ground at over 6000′ feet per minute spinning like a Frisbee! When not flying Spencer works in information technology (IT) and lives in Florida with his wife, children, and two dogs. His educational background includes an MBA from the University of Massachusetts, Amherst and a bachelor’s degree from the State University of New York. Education is the most important pursuit any human can undertake and Spencer speaks from experience when encouraging young people to pursue learning with passion. Departing MCAS Yuma to Set a World Record! 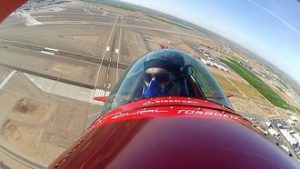 Spinning the Sunbird S-1x Inverted Over Yuma! Send Spencer an email now by clicking the envelope icon on the menu above or call 1-661-554-7194.